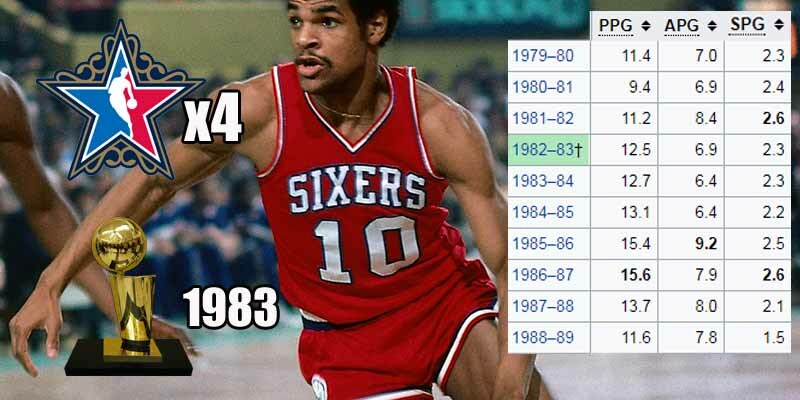 Point guard Maurice Cheeks joined Julius Erving on the late 70s early 80s 76ers, a squad that was a perennial championship contender and won the trophy in 1983. His offensive stats were pretty good with 16PPG and 9APG throughout his career, but he was very tough defensively, making it to four consecutive All-Defensive First Teams and an All-Defensive Second Team. He was also an efficient scorer and passer, shooting 50% and averaging only two turnovers per game despite playing 30 minutes a night. He also made it to four All-Star teams between 1983 and 1988.